Our school year has come to an end. I would like to start by saying thank you to all the parents for helping make this school year fun, creative, and successful, and most importantly, I would like to thank our children. They are truly amazing people. It is quite humbling to be a part of their growth and development. While some of our extended family is returning next school year, some will be moving on. We wish all of those moving on to new roads in their life the very best and hope they take with them warm, loving memories of their time with us at MSH. To those who will be returning, have a safe, fun and relaxing summer break, and we will meet again in August. This time of year is always so bittersweet for us. On one hand my heart breaks to see my friends go, and in the same breath, my heart swells with pride for how amazing they have become on this journey together. I suppose this is what love is all about. Thank you again from the bottom of my heart for sharing your children with us. It is hard to believe that the end of school year has arrived! Wow, what a year. To better state that, what a great year! We have learned a lot from each other and participated in many fun and exciting projects. We made many new friends along the way, too. Each of your children has brought such a joy and happiness to our classroom. We are so fortunate to have such a wonderful group of children this year. My friends and family often laugh at me when I refer to your children as ” my kids,” but they are like my own children. They all have touched our lives this school year in very positive and rewarding ways. We hope that the children who are leaving us this year will keep in touch as the years go by. Today’s technology can help us continue the relationships we have built. We encourage and welcome correspondences from you and your children anytime. We really appreciate all our parents, our staff, administrators, and board members for your help and support all through year! Thank you for your part in making this a successful year. Ms. Carol, Ms. Alicia, and I wish everyone a safe and fun summer! We will see you in August! In schools everywhere May is poignant time. Graduations mark milestones that are exciting for the student moving forward, but so bittersweet for the teachers and families who still see the student as a young child. Here at MSH we are not sending our students out into the world, but instead we are bridging to new classrooms and new schools. We still feel the same pride and love for those we serve and the sting of sadness as we must say goodbye. This May we will bridge in other ways. We say goodbye to our dear friend, Tinsley as she bridges from our assistant head of school to the world of parenthood. 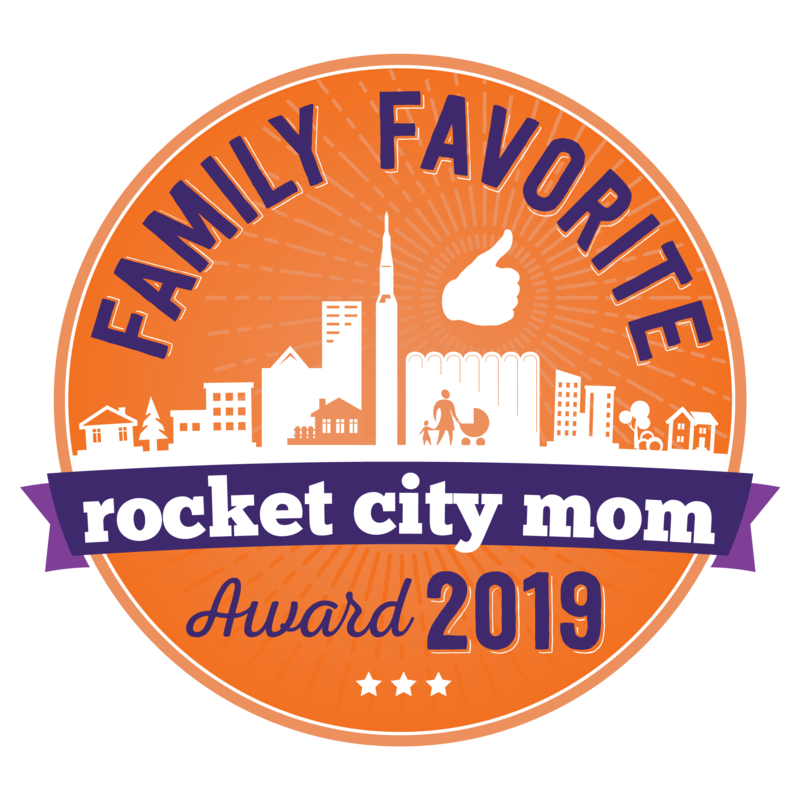 While we know that being a mom is the most important job in the world, we already feel the loss that will follow when she says goodbye on May 23. She is a cheerleader for MSH and the Montessori Method. Although you won’t see her sweet smile each morning, you can rest assured she will be cheering us on and spreading the seeds of Montessori in our community. You may have noticed a recent change at the reception desk at MSH. I am excited to welcome Jennifer Stark to the role of Administrative Assistant. She has already started in this position and I can see the great heights that she will help us reach. After working as an extended care teacher and part-time office manager, we are happy to welcome her full-time to the administrative team. We will put her degree in English to great use in the many hats she will wear in her new job. In addition, we will have 2 more joining the team. Karen Nielsen and Adriane Castro will both serve as part-time office managers. Both bring so many wonderful skills to the position. Adriane brings her experience as a registered nurse, along with an abundance of energy and enthusiasm. Her focus will be ensuring all DHR, Health Department and other regulatory agencies’ standards are met or exceeded, as well as chairing the fundraising committee. Karen brings her accounting degree and interior design experience and will focus on accounting, serving as librarian (a job she has voluntarily fulfilled all year), and chairing the legacy committee. The legacy committee will have the daunting task of preparing for MSH’s 50th anniversary in 2015. Change is part of life. However, the seeds of learning, community and friendship planted here at MSH will continue to grow and thrive. 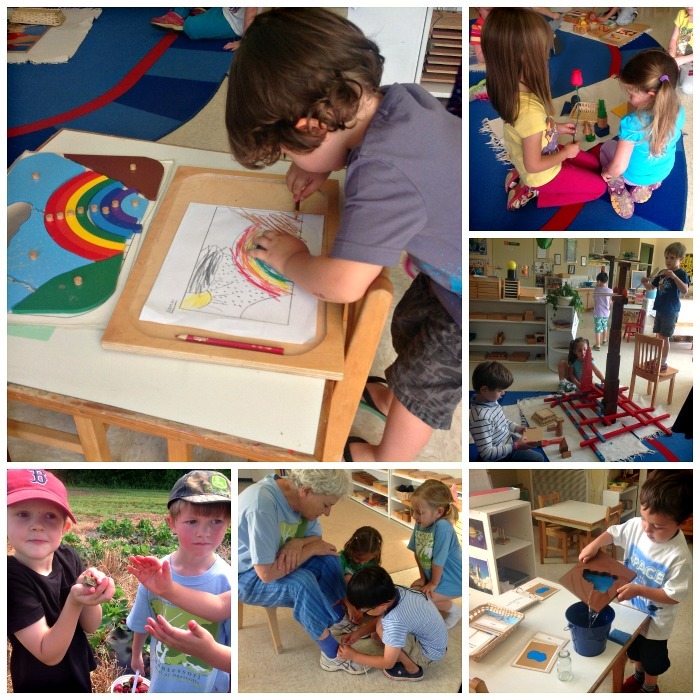 Time spent in a Montessori school ensures deep roots grown in the soil of creativity, independence and self-efficacy. As our little saplings enter their new stages of life, we look forward to watching them bloom! It’s hard to believe that we’re already wrapping up another school year! I’ve enjoyed working with and getting to know all of the children, and I look forward to seeing many of them again next year. In math, we are busy tying up our study of fractions (and some geometry). The children have enjoyed using the Montessori Fraction Circles, fraction bars, and the Geometry Box (aka “the box of sticks”). We have found the new fraction command cards from the Houston Montessori Center to be extremely valuable! Sci-Quest has continued to be a favorite activity every-other Wednesday. During their most recent visit the children had the opportunity to be engineers and build their own catapults. The final visit from Sci-Quest promises to be awesome, too. We will be dissecting a shark! In the classroom, we’ve been watching our ladybugs grow and recording our observations. It has been wonderful for the children to witness complete metamorphosis first-hand, while learning about the differences between complete and incomplete metamorphosis. *May 12th – 16th the 3rd and 4th graders will be taking the SAT. More information about testing details for the 3rd-4th graders will be coming soon. *May 12th the 2nd graders will be participating in the strawberry picking field trip to Brown’s Farm. *The Elementary Bridging Ceremony will be May 20th at 2:00 p.m. The 3rd graders will be bridging from Lower Elementary to Upper Elementary, and all of the children will be performing a song. Everyone is invited to come enjoy the performance and a small reception. *Field Day is scheduled for Wednesday, May 21st. Be on the look out for more information as the date approaches! *Finally, the last day of school and our picnic at McGucken Park is May 23rd. Thank you so much to all of the parents who have helped out this year by volunteering in the classroom, chaperoning, donating materials, etc… This year would not have been as successful without you! 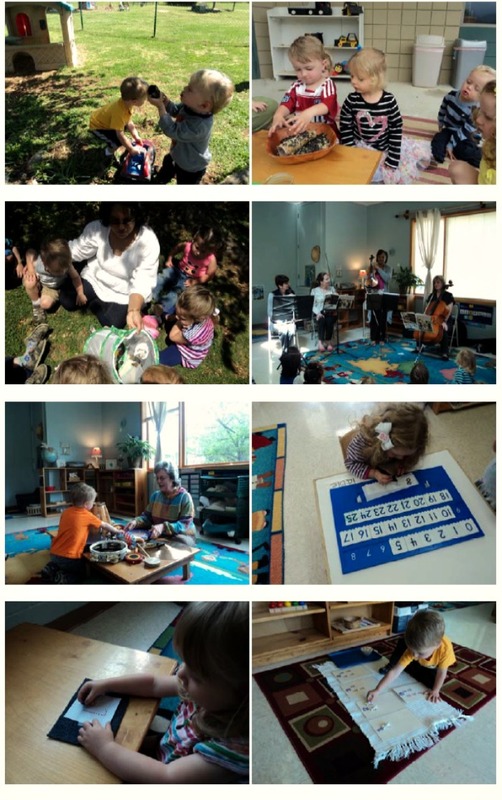 I can’t believe this is the last blog from the Toddler II classroom for this school year. I need to express my gratitude to my kids, my assistant teacher, the extended care teacher, administrative staff, and the board members for all that they have done. I would also like to thank Steve Stripling who always helps keep our classroom pretty. We all worked hard as a team and sailed smoothly throughout the year. I would also like to thank my parents for giving us their continuous support and their warm and friendly help. Last month, Kelly (Roman’s mom), visited our classroom with her musician friends. They played three different kinds of string instruments: violin, viola and cello. The children enjoyed the program so much. Ms Kathy, our music teacher, is also bringing different musical instruments from different parts of the world into every music class. The children are so happy to experience these new instruments. This month, we are wrapping up our observations of the life cycle of a butterfly. In the past few weeks, we watched as the little caterpillars turned to adult butterflies before our eyes. We are going to do an activity with the butterfly life cycle as an art project. We are watching our vegetable garden which we created from scratch grow daily, also. This time of the year is a very happy, yet difficult and sad time for me because our older children are moving to primary class. We are going to miss them so much, but at the end of the year when I look back I see they have grown so much physically, socially, academically and mentally. That makes me so proud. I can’t wait to see their happy faces walk through the door every morning. That makes me feel so good. I love reflecting back on all that I have learned from them this year. I wish everyone a fun, wonderful summer.